As time passes, our understanding of the scale and importance of the UK’s coal industry fades. In the 1950s and 60s, most homes had coal fires, and electricity and gas were both produced from coal. In our grandparents’ childhood, more than a million men were directly employed in the industry world’s railway and UK coal powered most of the world’s shipping fleets as well as our own massive industrial base. This country’s coal reserves were a major factor in our leadership in the industrial and commercial spheres and it can be said that Britain’s success was ‘built on coal.’ The success of the coal industry also bought a high toll of deaths and injury, dangerous levels of atmospheric pollution and acute industrial unrest. In 2015, as this book goes to press, the UK’s last deep coal mines will close and the country’s residual requirements for coal will be met by imports from places such as Poland, Columbia and China. The Yorkshire coalfield produced a greater output than any other single area in the UK since the First World War, and until the 1990s was still host to a number of large and highly efficient mines. The pits themselves, the communities that housed the miners, and the related industrial and transport infrastructure had their own distinctive atmosphere and ethos, most of which has now passed by. Spoil heaps and headgear, the obvious markers of the industry, and are now notable by their absence. 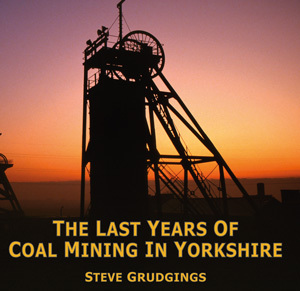 • A unique pictorial record of the fast few years of coal mining in Yorkshire and contains over 400 images of large and small colleries across the district. •Choice of photographs was made of the basis of their breadth of coverage and well historic and aesthetic merit.